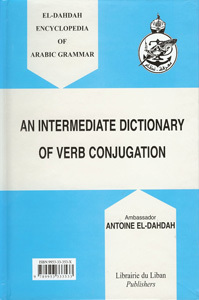 This is an intermediate dictionary of verb conjugations giving the reader different conjugations for different verbs. Hundreds of verbs are fully conjugated. The book displays the conjugation of the mudhaari’ and maadhi ma’loom, mudhaari’ and maadhi majhool, and the amr for each ‘mutakallam’ being addressed. This goes for all different types of verbs: naaqis, mithaal, ajwaf, muda’’if’, etc. This book of verb conjugations is completely in arabic.